Heat skillet with 2 tablespoons of oil. 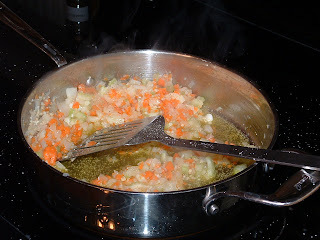 Add onion, garlic, celery and carrots, Saute’ until tender. 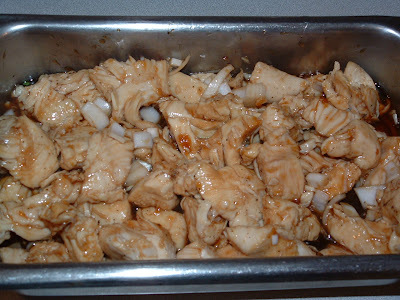 In a large mixing bowl toss meat pieces with sesame oil, sugar, salt and pepper. Add vegetables and blend well. 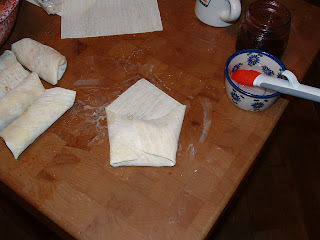 Fill center of each wrapper with 2 tablespoons of filling. Fold 1st corner towards the center. 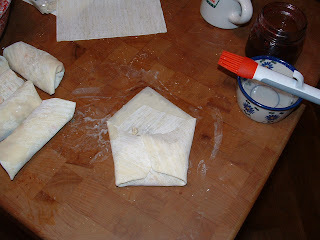 Then fold each edge towards the center. 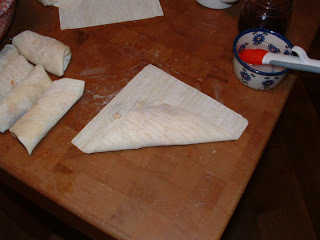 With a pastry brush wet the exposed triangle of dough and roll the bulk onto it. Add oil back into pan and add the additional 2 tablespoons and bring to medium heat. 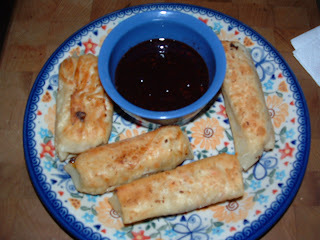 Cook egg rolls on all 4 sides until golden. Heat jam in microwave for 20 seconds to warm and thin. Whisk in honey and soy sauce. I added shredded carrots, peas and broccoli. Sift together the flour, cornstarch, salt and baking powder. Coat the pieces chicken, shaking off any excess. Heat a large skillet or a wok-shaped nonstick pan over medium-high heat with safflower oil. 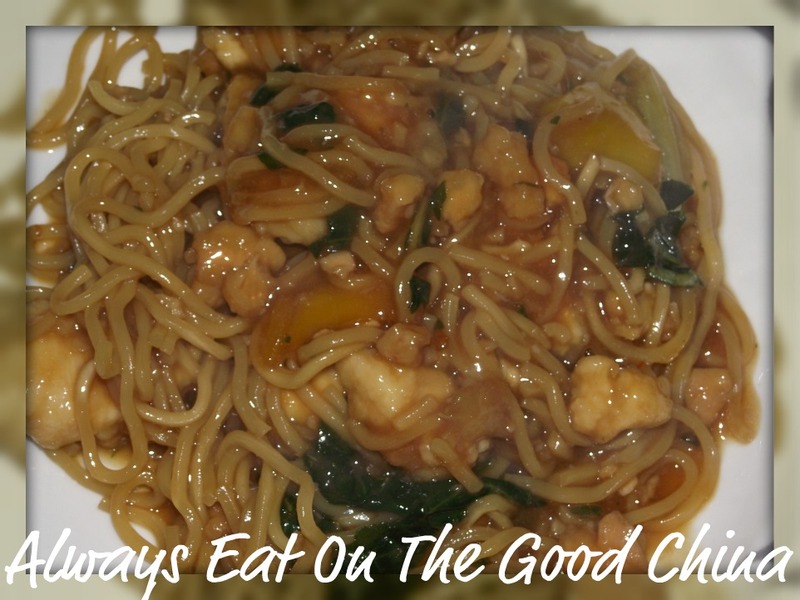 Stir fry chicken until golden, 3 or 4 minutes. Remove chicken from the pan and return pan to heat. Add a splash of vinegar to the pan and let it evaporate. Add stock, soy sauce and sesame oil to the pan and scrape up any drippings with a whisk cooking until slightly thickened. Add chicken back to the pan and simmer for 1 to 2 minutes to thicken sauce and finish cooking chicken pieces through. Remove the pan from heat, add the scallions or chives and the lemons and zest. 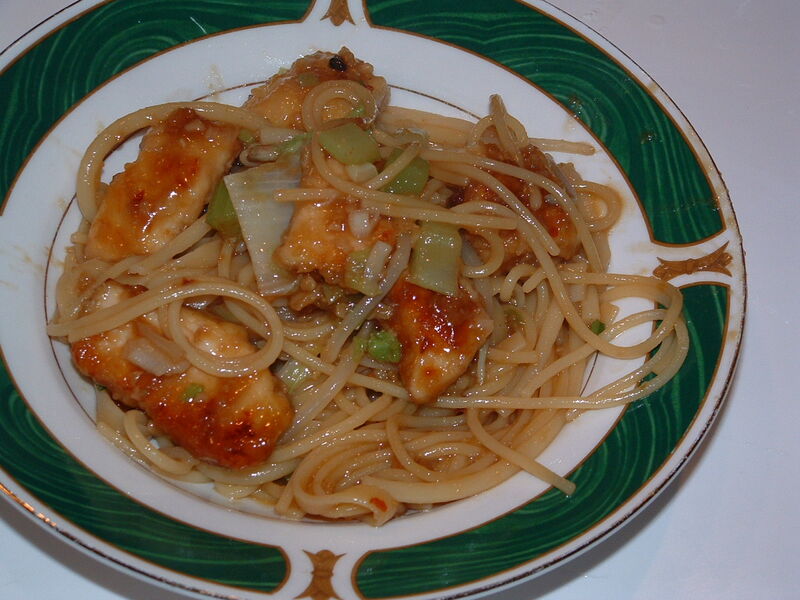 Toss chicken pieces well to combine zest and scallions or chives evenly throughout the sauce. 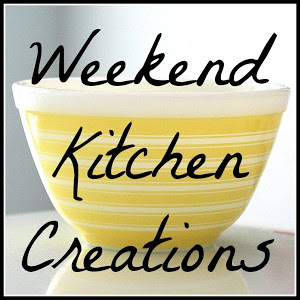 Whisk together 1 tablespoon cornstarch and egg white. Coat chicken with cor starch mixture and let rest for 1 hour. 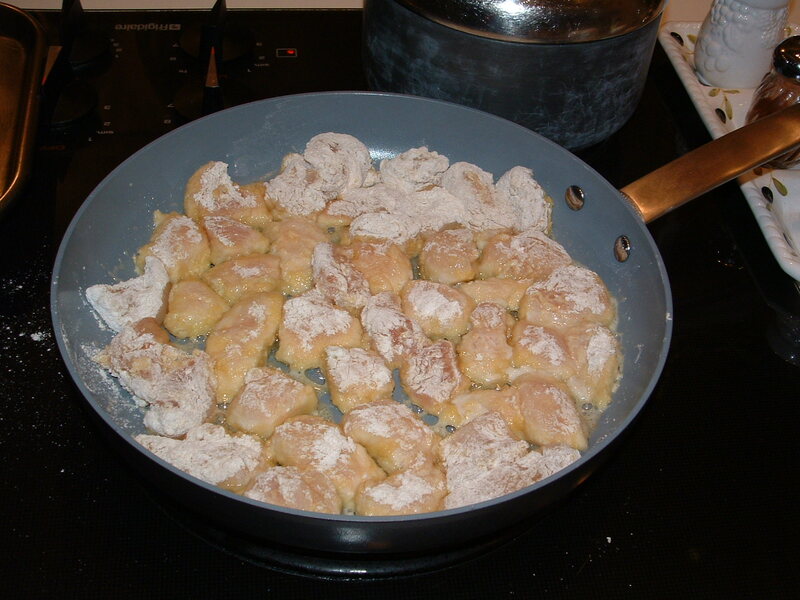 Drain cornstarch mixture from chicken pieces. Heat 1 ½ tablespoons of oil in wok. 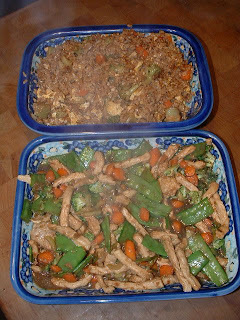 Stir fry chicken pieces until just about cooked through. Remove with slotted spoon to mixing bowl. Add bok choy, yellow pepper and onions cooking until just done. Add drained noodles to mixing bowl. Heat oil in your wok. Add garlic and ginger and stir fry for 30 seconds. Add salt, honey, vinegar, and water. Mix well. Combine 1 teaspoon of water with 1 teaspoon of cornstarch. Add to the sauce and Simmer for 2 minutes. Coat chicken with the sauce and toss well. In a small saucepan combine the soy sauce, lemon juice, sesame oil, sugar and garlic. Whisk the cornstarch into the water until smooth. Add the cornstarch mixture to the soy sauce mixture and blend well. Bring mixture to a boil, reduce heat and simmer until thick. 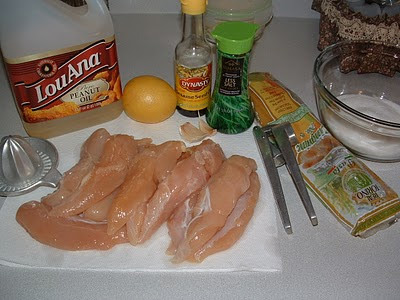 While the sauce is cooking, salt and pepper the chicken tenders and broil 2-3 minutes each side. Shred chicken, slice green onions and add to the linguini. Pour sauce over top and toss well. Mix cornstarch, flour, salt & pepper in ziploc bag. 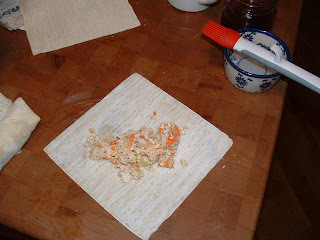 Toss chicken pieces in beaten eggs and sesame oil and then dredge in the flour bag. In a large skillet, heat olive oil. 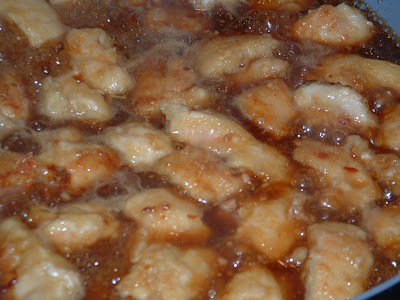 When hot, add the chicken pieces and cook turning as needed until all sides are golden brown. 4-8 minutes. Drain chicken on paper towel lined plate. Pour off excess oil and clean pan with paper towel. Add 1 tablespoon more olive oil and saute’ garlic and green onion. Add the soy sauce, sugar, honey, orange juice, sherry, red chile pepper flakes and ginger. Cook until thick, do not boil. Dip in honey mixture and place on sprayed cookie sheet. If you would like sprinkle some sesame seeds over the chicken at this point. Brush with original glaze after the first 10 minutes. Save any additional glaze to use over the rice. 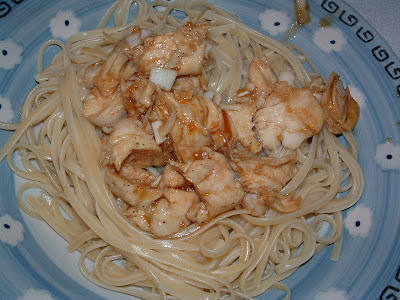 Whisk in honey and sauce sauce. Whisk together the cornstarch and egg white. Coat the chicken strips and chill 1 hour before preparing the meal. Heat 1 tablespoon peanut oil. 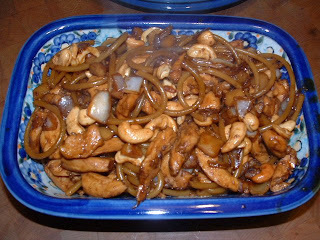 Quickly stir fry the mushrooms, onions and bean sprouts. Lift out veggies with a slotted spoon and set aside. Add another tablespoon +/- of peanut oil and heat. Add chicken pieces and stir fry until white and tender. 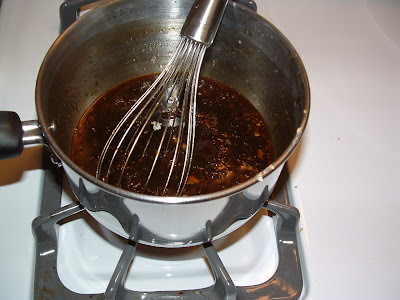 Whisk together the rice wine vinegar, soy sauce, bead molasses, salt and sugar. 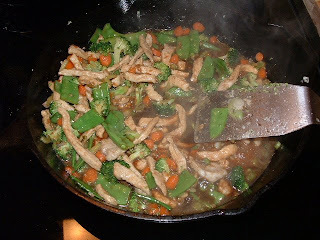 Add to pan and coat chicken well and continue stir frying until most of the liquid is absorbed and chicken is glazed. Add veggies back in as well as the cashews. Mix well and heat through. Serve over rice or with noodles. *You just can’t always get fresh and I don’t care for the canned. 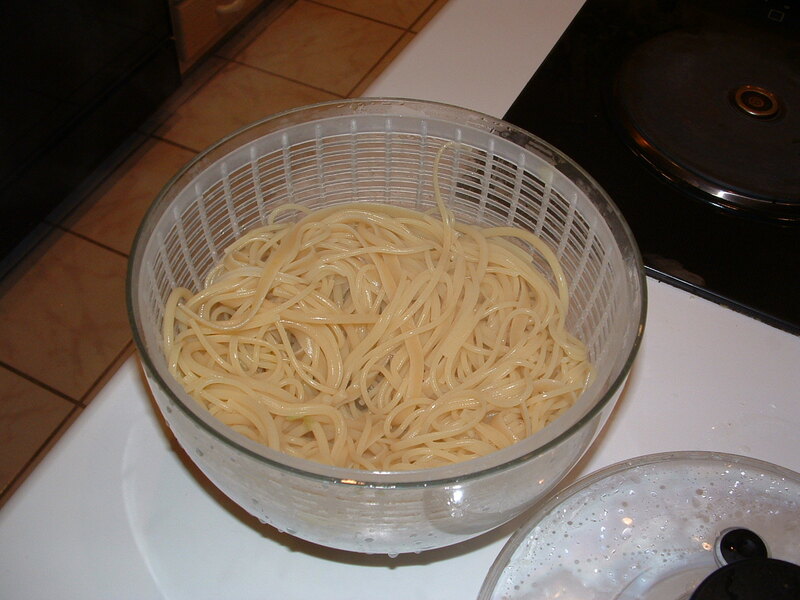 I use my salad spinner for draining pasta to get all the excess water out. Over a medium high flame heat the peanut oil in a heavy skillet. 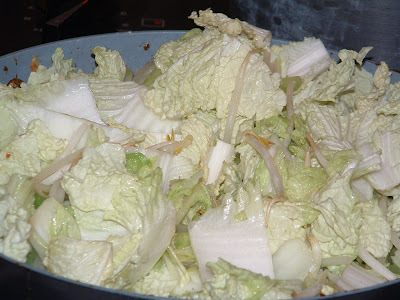 Saute’ the celery, onions, bean sprouts and cabbage until cabbage is wilted. Add a bit more oil and saute’ chicken pieces. Add the broth, sesame oil, soy sauce and sugar. Simmer for several minutes. Whisk the cornstarch into the cold water until smooth. Add to the broth mixture and bring to a boil. Add vegetable mixture and chicken pieces back in, heat through and coat well. Toss with prepared pasta and heat through. 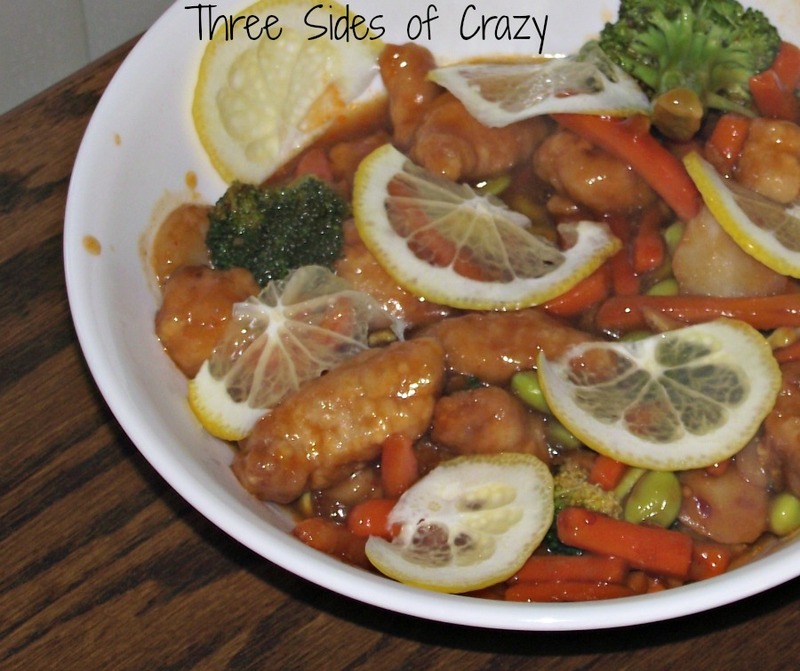 I’ve been trying to get more and more vegetables into our diet as we approach spring and stir fry has been a great taste tempting treat for us recently. An hour before you plan on cooking slice pork chops into thin strips. Whisk together the egg white and cornstarch. Coat pork strips in egg mixture and chill for 1 hour. Slice the onions, carrots and broccoli to bite size pieces. Cut the snow peas in half if they are large or leave whole. Heat peanut oil to medium high. 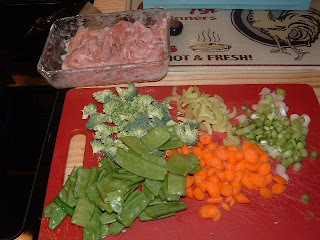 Stir Fry pork pieces quickly and remove to drain on paper towel. Add vegetables and stir fry until tender. Add pork slices back in. 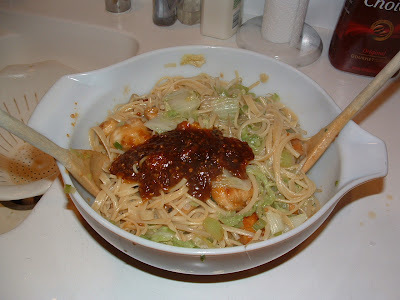 Whisk together the soy sauce, sesame oil and orange juice. Add to the pan and toss to coat. 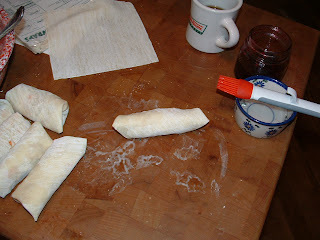 Heat through until glaze forms. 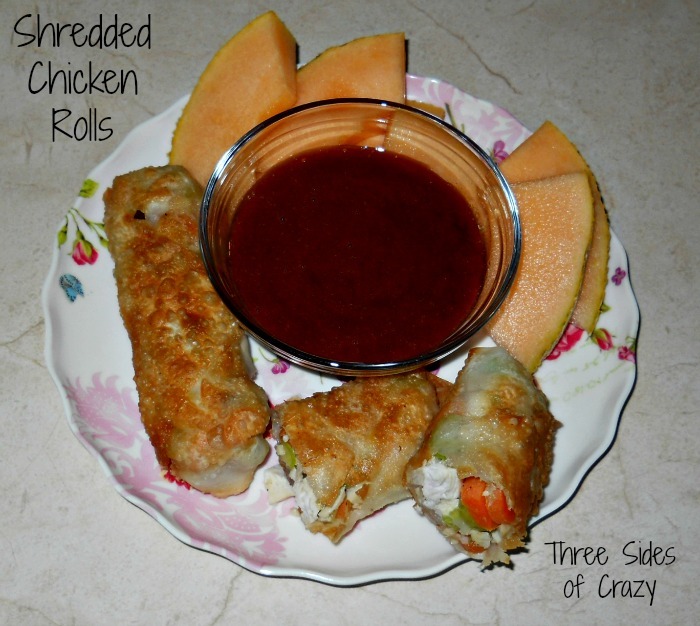 Serve with Fried Rice (recipe follows). In a small pan scramble the eggs and set aside. 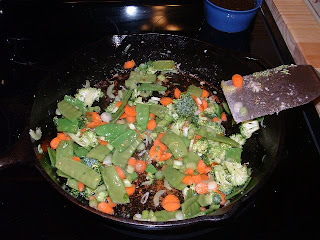 Melt the butter in a skillet and saute vegetables until tender. 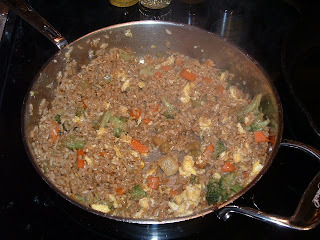 Add the rice, soy sauce and sesame oil, stirring constantly. Just before serving add egg back in and heat through.